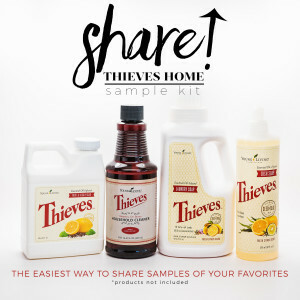 Introducing the Thieves Home Sample Kit! We are thrilled to announce our new SHARE! Collection of sample containers and materials. We created these to help you share the most popular Thieves Products for your home. Here are some questions and answers we thought might help you figure out exactly what this is, how to get it, and how you can use these samples to help grow your business! Q: How much does this kit cost? Q: How many samples can I give with this Kit? A: 4 sets of all 4 products! It has 16 bottles and 16 labels (4 for each product), so you can give out up to 16 individual samples. The kit contains 6 Product information cards which have usage and instructions for all 4 of the Thieves products in the picture to the left! We included 2 extra cards in case you need them! Q: Why did you start with the Thieves Home Sharing Kit? A: We started with the Thieves Home Sharing Kit because it is the perfect accessory to the Toxin Free Family Graphic Series we did in January 2016 for our ORD Subscribers. It was designed to be used in conjunction with them to demonstrate the power of the product. We all know when people try these products, they are quickly convinced by how well they work and fall in love with them too! (6) – Product Info Cards which contain usage instructions for all 4 products in one. Q: What method will these be shipped? A: These are typically shipped First Class Mail, unless you select a different method at checkout. There will be delivery confirmation so you can track them also! Q: Can I have an order dropped shipped to my downline? A: Yes! Simply create a separate order, enter your billing information & your downline’s shipping address. At this time, the system will not allow you ship to multiple addresses in one order. Q: Do they contain the actual Thieves products? A: No, these are just the bottles, labels, and information cards. You provide the actual product and pass out the samples! Q: Can I order a SHARE! Kit with my other store purchases? A: At this time, the SHARE! Kits can only be ordered independent of any other items. Q: How many SHARE! Kits can I order? A: You can order as many as you want! Q: Are there other kits available in the SHARE! Collection? A: YES! We also have the Share Beauty Sample kit. Q: Can I make suggestions on what I would like to see in a SHARE! Collection? A: Yes! We would love your feedback! We have a quick survey for anyone who places orders and we encourage you to send suggestions to: help@oilrevolutiondesigns.com with a subject line: SHARE! Kit Suggestion. Q: Is there a telephone number I can call if I have questions? A: If you have questions, we would love to hear from you. While we do not have phone support, we do have a help desk ready to answer all your needs. Simply email help@oilrevolutiondesigns.com and let us know how we can help.